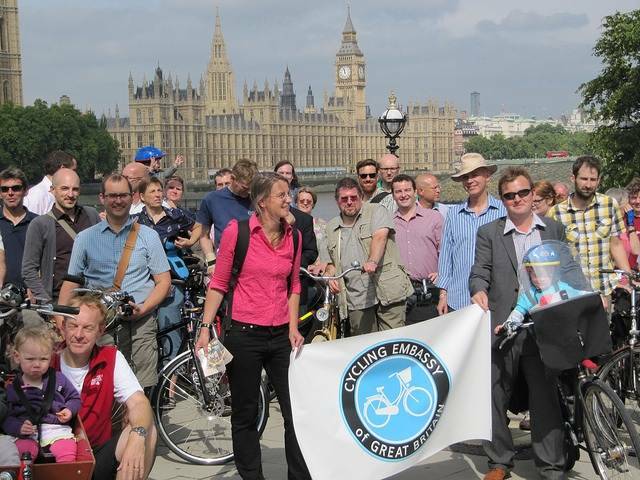 Vole O'Speed: Skyride and a launch: the past and the future of London cycling? Skyride and a launch: the past and the future of London cycling? Distinguished guests, ladies and gentlemen, boys and girls. Welcome to this launch and picnic for the Cycling Embassy of Great Britain. We find ourselves in a strange land, where grown men feel that they not only have to put on helmets and body armour but put cameras on it too. Great as a resource, great if you’re Quentin Tarantino but useless if you’re a 10 year old wanting to go to school. Where something that our grandparents did without question has become so marginalised. So specialised. Where Councils provide facilities without any real knowledge of what they’re providing for. The end result looks like it was designed by a combination of an Etch-a-Sketch and a litre of vodka. It doesn’t have to be like this. If we don’t get it right then we shall see more Superhighways that double as car parks at the weekend, more converted pavements bringing cyclists into direct conflict with pedestrians, the elderly and disability groups. We are proud to have as a guest a representative from the Embassy of the Kingdom of the Netherlands [Mr Jan van Weijen – Head of Public Diplomacy, Press and Culture]. The Netherlands is a country that made a change for the better nearly 40 years ago and has also been a particular inspiration to the Cycling Embassy. They’ve made mistakes, they’ve learnt from their mistakes and now 27% of all journeys are made by bicycle. In Britain, it is 2%. Their children can start cycling to school from the age of 8 and in a UNICEF study in 2007 they topped the table for child wellbeing. Britain came 21st. the USA came 20th. Could try harder. We launch our policies today and they will develop in time with further consultation with other organisations and of course, you. Have a look at our policies, our Manifesto & Mission Statement. Have a chat with me today. If you share our beliefs then please donate if you can, chat on our forum, even buy the T-Shirt in the new Embassy shop just launched. We shall be posting a Situations Vacant page very shortly to give greater clarity to those that want to help in terms of ideas of expertise. We want to make riding a bike as easy as riding a bike and we know you do too. 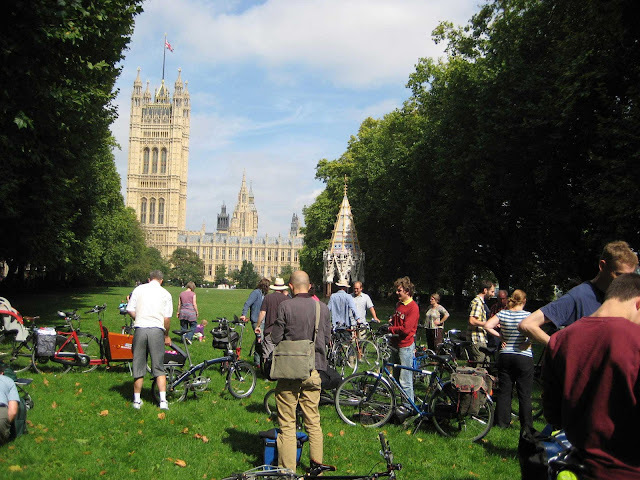 After that it was off for perhaps the shortest organised bike ride ever, across Lambeth Bridge to Victoria Tower Gardens for a picnic. When we planned this we thought that Lambeth Bridge had the worst cycle lanes in London, but, bizarrely, as if Transport for London had got wind that the bridge was to be exposed to the bright light of publicity across the whole world of cycling, it was resurfaced on Thursday night and the lines were repainted on Friday. The southbound cycle lane is now gone and the northbound no longer quite the worst cycle lane in London. But the bridge remains sandwiched between two profoundly cycle-unfriendly roundabouts, the cycle lane ending before it gets to either of them – pointing up the uselessness of providing cycle facilities in a spot manner ("pepperpotting" as it is also known) rather than as parts of properly worked-out continuous routes. And on the roundabouts (particularly the southern), we did indeed encounter drivers seemingly determined to put an early end to the Cycling Embassy of Great Britain. Fortunately they failed. 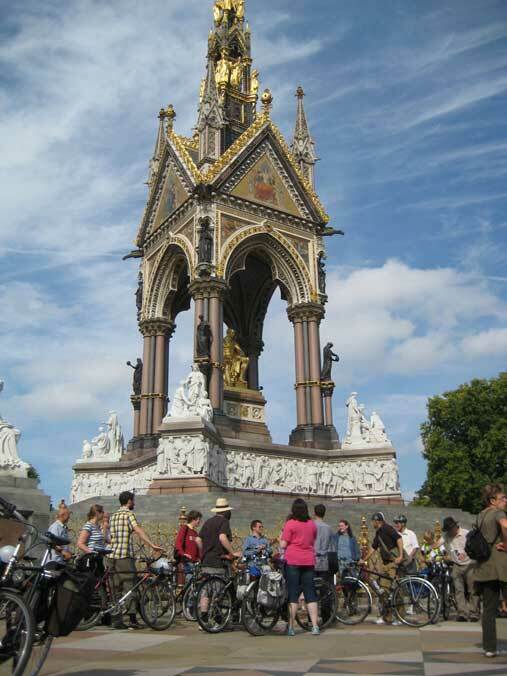 And so on to the picnic, which was followed by a ride led by Mark Ames (ibikelondon) along the permitted cycle routes through the Royal Parks as far as the Albert Memorial, where, after more photos, the group dispersed. Some people had come from as far afield as Scotland, Newcastle, and Bristol, emphasising that this is a national campaign, not a London one, and some of them stayed on in London for the Mayor of London's Sky Ride the next day, to distribute Embassy postcards to the throngs of people on bikes at this event. The weather went rapidly downhill on Sunday, and heavy rain dampened enthusiasm for the Sky Ride, participation in which was down to about 50,000 from 80,000 last year. The Mayor of London's Sky Ride is a concept that was originally suggested by the London Cycling Campaign. It was known as the "London Freewheel" before Boris Johnson sold it off to Sky Sports, who, with British Cycling, put a sporty cycling gloss on it and divorced it further from anything to do with cycling for transport. In this event, a seven mile circuit of central London streets is given over exclusively to bikes for a few hours once a year, cyclists are dressed up like yellow canaries for no apparent reason except to unwillingly advertise Sky Sports, and a huge number of obstructive barriers is erected around The Mall to prevent anybody from conveniently walking anywhere, enforced by a huge number of paid-for-the-day officious event staff who shout orders at you and tell you what a good time you are having. LCC organises a large number of feeder rides from the suburbs to the Sky Ride, for which it gets paid by TfL, and these tend to attract a lot of new or occasional cyclists, attracted by the prospect of cycling on traffic-free roads. However, a critical point, which shows the lack of real commitment to the concept from the authorities: the routes from the suburbs to the start of the course are not closed to motor traffic. Volunteers are expected to marshal groups of hundreds of beginner cyclists, including small children, through heavy and aggressive London traffic, for distances of 10 miles or more to the start of the traffic-free circuit. In recent years Sky has developed the concept and there have been smaller Sky Rides in other parts of London and elsewhere in the UK. To my mind, while the Cycling Embassy is the start of a potential new dawn for transport cycling in the UK, the Sky Rides are a symbol of the failed past of UK cycle promotion. Boris Johnson thinks the Sky Rides are "a key part" of his "cycling revolution", but this is tosh. The is no evidence that the Sky Rides make any contribution to a modal shift to cycling in London. If they did, we should see, in the weeks after Sky Ride, a new tranche of cyclists on the streets in their free Sky high-vis tabards. We don't. In my experience, those who come on the Skyrides are either regular cyclists already, or they are those who drive down, take the train up, or take part in the marshalled feeder rides, for their once-a-year experience of cycling in London, to put the bike away afterwards for another year, apart from possible leisure rides in the countryside or abroad. To expect Sky Ride to encourage more people to cycle under everyday London traffic conditions is like expecting the experience of taking a cross-channel ferry to encourage people to swim the channel. It unrealistic, as the conditions are so profoundly different. Why can't we see traffic-free cycling every day? Isn't it nice when there is space for everyone to ride their bikes? Families love events like Sky Rides, but when asked why they don't cycle every day, the answer is clear: it just feels too dangerous. We can't get rid of cars, but we can start to work towards providing safe, separated cycle tracks designed to be used by all, even the youngest children, away from motor traffic. Evidence from the Netherlands - the bicycle capital of the world - show that if you provide safe space for cyclists everyone - men, women, old, young, rich, poor - will feel happy choosing to ride their bikes. We at the Cycling Embassy of Great Britain want to see an end to cyclists being pushed to the margins; we want to see a network of direct, well-designed, separated cycle routes that are safe even for young children to use, so that every ride can be a Sky Ride. Sky Ride itself is a waste of time and money. 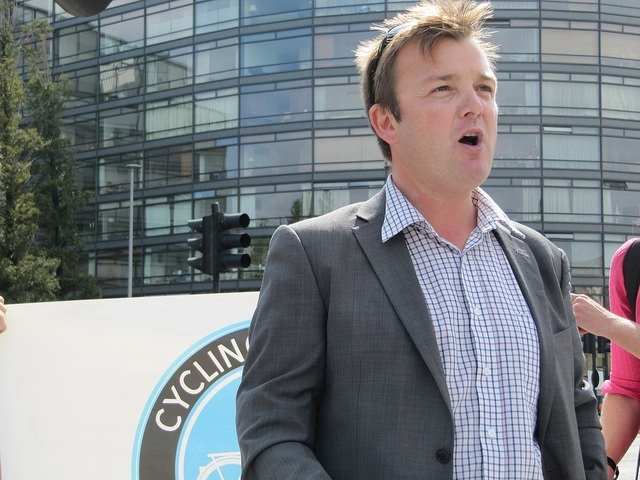 The principle may have been thought up by a cycling organisation, but it is is a failure. It is a sop so that Boris Johnson and other politicians, and business sponsors, can claim they are "promoting cycling", while doing nothing to make everyday cycling safer or more attractive. The Sky Rides re-enforce the leisure ands sports image of cycling in the UK and further divorce it from anything to do with ordinary transport. They promote an image of cycling as an activity to be done wearing helmets and bizarre ugly clothing that no-one wants to wear. They take away volunteer and activist time and energy of dedicated cyclists that could otherwise be spent on lobbying for better conditions. By involving voluntary organisations like the LCC they lock them into a contracted-out government service role that is irrelevant to their true purpose, and again, simply a distraction. They promote corporate entertainment and sports interests that are antithetical to the true healthy spirit of independence and individuality of "just riding a bike". For these reasons the Sky Rides positively work against cycling. The Sky Rides are a symbol of a non-cycling nation and the Mayor of London's Sky Ride is a symbol and symptom of a non-cycling city. Rather than a one-a-year experience of traffic-free cycling in central London, what all those people who take part really need is traffic-free cycling in their local neighbourhoods 365 days a year. If we had a real cycling city, we would not need Sky Rides, nor feeder rides, nor websites, nor registrations, nor tabards, nor marshals, nor banners, nor gratuitous appearances by cycle racing celebrities, nor PA systems for telling people what a great time they are having on their one day of cycling in the year, nor any of the other caboodle. Everybody would just ride where they liked, when they liked – quietly, happily, normally. There would be no demand for a Sky Ride. Let's leave Sky Ride. Let's get on with the work that will consign it to the dustbin of history. Yes, I would accept once a week. That would be worthwhile. 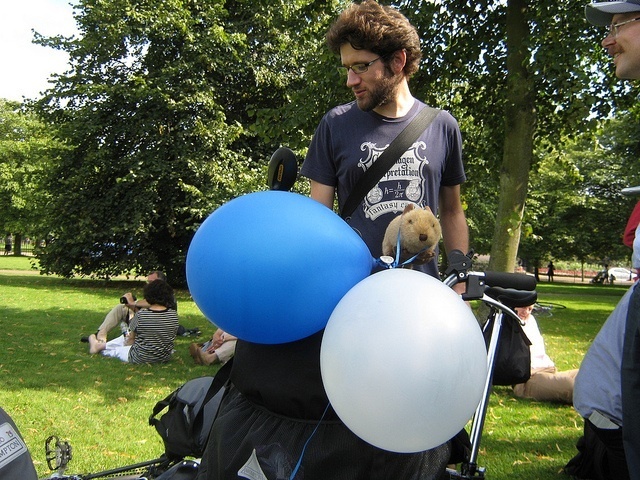 I hope the CEGB launch party paid tribute to the memory of Peter Griffin, the cyclist who died in March this year after a collision on the motor traffic free road in front of the Albert Memorial. Sky ride is all about maximising the area of barrier covered in blue Sky advertising banners, along with all those nasty yellow advertising bibs the riders obediently wear.